We’re still in January, and I can already tell that this will be the most polarising movie of the year. 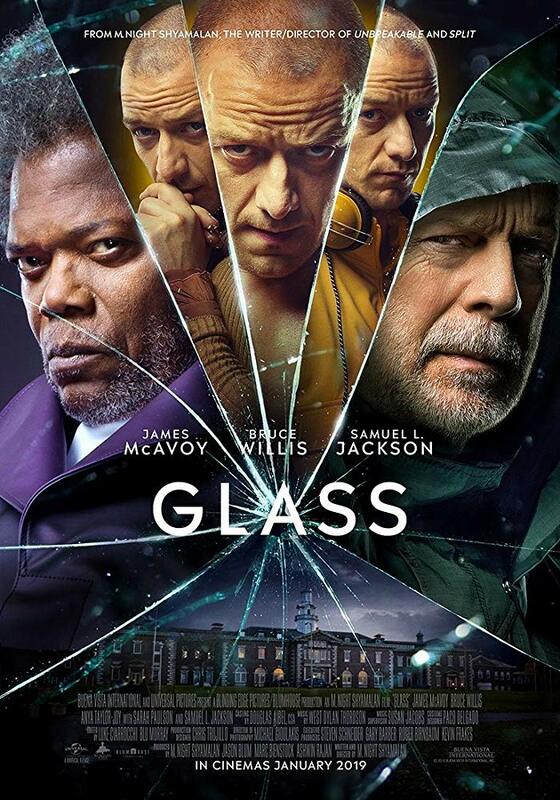 Starring James McAvoy, Bruce Willis, Samuel L. Jackson, Sarah Paulson, Anya Taylor-Joy, Spencer Treat Clark, and Charlayne Woodard, Glass is the third and final entry in M. Night Shyamalan’s Eastrail 177 trilogy, which also includes Unbreakable (2000) and Split (2017). It follows David Dunn (Bruce Willis), who uses his abilities to pursue Kevin Wendell Crumb (James McAvoy), a man with over twenty distinct personalities, while the shadowy yet powerful presence of Elijah Price (Samuel L. Jackson) holds secrets that will affect both men. When it comes to M. Night Shyamalan, he is a rather intriguing filmmaker. He has crafted some excellent movies and a few terrible ones. But he has made a comeback after his surprise hits The Visit back in 2015 and Split in 2017. When it was revealed that Split was a sort-of sequel to Unbreakable, a movie I love, everyone lost their minds. Then he announced that Glass, a sequel to both Unbreakable and Split, was coming out and I was very excited. After watching Glass, I have a lot of mixed feelings which I will get into shortly. M. Night Shyamalan was crafted one of his most polarising films yet, and it saddens me it’s like that. There are a lot of excellent ideas here. Some are executed expertly, and others could’ve been done a lot better. I’ll start with the positives, with performances up first. James McAvoy was outstanding as Kevin Wendell Crumb. If you thought he was terrific in Split, wait until you see him here. McAvoy is at his best with him performing as all of his personalities throughout Glass. Yes, he does focus on about four or five characters (mainly the ones from Split), but he somehow makes every personality distinct from one another and one scene that involves a rotating camera for a couple of minutes shows just how quickly he can switch to and from a different personality. I know it’s very early in the year, but I think McAvoy’s performance will be one of, if not the best of 2019. Samuel L. Jackson is also fantastic as Elijah Price. It was great to see his character return after 19 years, and he’s just as intelligent as he was in Unbreakable. As a villain, it’s so easy to sympathise with him considering what his character has gone through with his disease. Jackson’s portrayal as a man who believes in superheroes and himself being the arch-nemesis of David Dunn is fantastic, but considering the movie is named after him, I feel like he should’ve been in it more. Bruce Willis really surprised me with his performance, as for the last few years, he hasn’t had many good movies. But here he is terrific, and you can tell that he loves this trilogy and his character. He’s just as likeable as he was in Unbreakable and as a vigilante, he’s excellent. His relationship with his son Joseph, who is played by Spencer Treat Clark, was also a highlight of the film. Everyone else from Sarah Paulson to Anya Taylor-Joy did a solid job with the material they were given. But that leads me to the writing which was a mixed bag. The script is one of the most critical aspects of a movie, and Shyamalan’s writing here is both good and bad. Don’t worry, I’m not going to spoil anything, but I’ll try to get my point across. The characters, well at least the main three, are written exceptionally well. Their dialogue is excellent and most of the time, the writing is captivating. The main problem I have with it is that there is a lot, and I mean A LOT of exposition. Don’t get me wrong, exposition can be excellent and essential sometimes, but here it’s like Shyamalan doesn’t trust the audience. It’s like he doesn’t think anyone has seen Unbreakable or even remember some of the significant events in Split. The number of times major plot points from those films, or at least character traits were repeated, I was sick of it. This is not a good example of exposition, and it’s put right in your face every single time. There were also some, how should I say it, questionable choices made in the writing department regarding some of the characters and their decisions. I won’t go into it as it will touch on spoilers, but I can say that Anya Taylor-Joy’s character could’ve been written better this time around. Considering this takes place a couple of weeks after the events of Split, she doesn’t seem affected by that horrifying event. And because it is an M. Night Shyamalan film, you expect his trademark plot twists, which left me with mixed feelings. Shyamalan’s direction is also a mixed bag, and that does sadden me. Like I’ve said many times throughout this review, there are a lot of fantastic ideas here, but some of these ideas could’ve been done so much better. It feels like Glass contains two different movies. I loved the first two-thirds of the film, with it being a great mixture of Unbreakable and Split. Seeing all of these characters on-screen together was terrific, and it was a great character study. Then something happens, and we get a somewhat messy last act that feels like another movie. I know that some of you will love this and be confused as to why I think this way, but that’s just my opinion. The cinematography was fantastic most of the time, and I would consider this the best looking film in Shyamalan’s career yet. But again, there were some questionable choices made, including a very dark first action scene and some really bizarre POV shots in the third act, which were overused to say the least. There are some great shots, and most of the time, the cinematography was excellent. But these strange choices that were made just made it feel hollow at times. Look, despite the glaring flaws, I’m actually really keen to watch it again. It’s strange, but it’s still a well-made film and a solid conclusion to a trilogy we didn’t even know we needed until now. It may sound like I hate this movie, but I don’t. It’s not bad, but at the same time, it could’ve been so much better. Overall, Glass is an enjoyable and thrilling conclusion to M. Night Shyamalan’s Eastrail 177 trilogy, which has technically been 19 years in the making. Despite some significant flaws including too much exposition, strange character choices/motives and questionable camera shots, the captivating performances, well-written characters and solid direction make Glass a solid, yet polarising film. Yes, I feel like the third act was messy, but just about everything else leading up to it was an enjoyable journey, and one that I’m sure will be talked about for a while.